In some other situations in .NET you might get this error as well (not directly related to ASP.NET, but sometimes to Interoping code or COM code), but this is beyond the scope of this post. In the cases that I’ve stumbled upon, the reason is usually related to on-the-fly compilations ASP.NET performs when first accessing a certain page on an application. The main problem with this exception that it is less than informative 🙂 . The only way of actually figuring out what is wrong (if this is indeed a case related to compilation error like I’m talking about) is to dig deep using WinDbg. 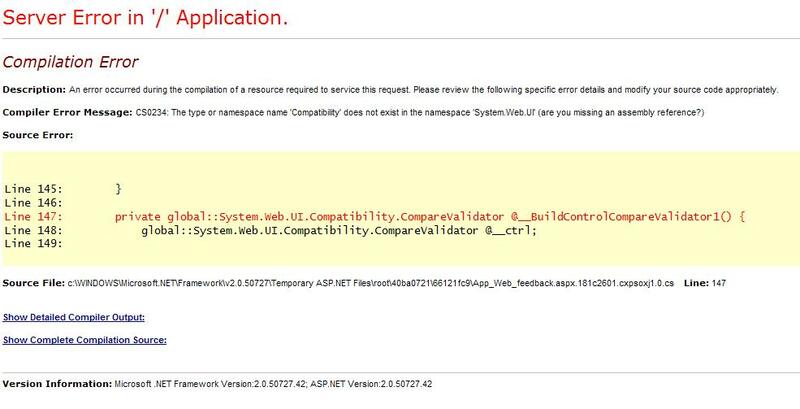 Luckily, every compilation that runs inside ASP.NET uses an API that upon encountering an error will create an object in the heap called CompilerError. Make sure you have CLR exceptions enabled (see this previous post about how to enable CLR exceptions in WinDbg). Try to access the page that is not working, it should throw an exception and WinDbg should break in. This should produce a list of all CompilerError objects which should allow us to inspect them and see the exact compilation error. Where 0xXXXX is the address of the objects listed in the list you got from the !dumpheap command. At that point you should see the CompilerError object itself and you can dump its errorMessageText member (it’s address is near its name) using !dumpobject which should show you the exact compilation error. In my case, the problem was that in the web.config file under the <compilation> / <assemblies> element there was no reference to one of the AJAX.NET assemblies (System.Web.Extensions) which caused the page to fail during on-the-fly compilation. Do remember that this exception sometimes has nothing to do with compilation. If you don’t have any object of type CompilerError or there are a few but they make no sense in regards to the page you are accessing it might be something else. The ASP.NET Repeater control is a very useful patten that minimizes code and allows you to use templates to represent repetitive data. All of you are probably familiar with it and use it quite often. Yesterday I had a big fight with the repeater control, and since most of the Internet (actually search engines for that matter) is filled with lots of data about the Repeater control and how to use it, I couldn’t find the answer I was looking for. Apparently it was staring me right in the face. An additional and unwanted extra space before the comma. All seems well, right? there is no space before the comma in the separator template, but there was when the whole thing was rendered. The extra enter which placed the </ItemTemplate> element in a new line was the cause of this problem. That new line was translated in this case into a single space which made everything look weird. It seem that the Repeater control (and possibly other template based ASP.NET controls) are sensitive to the ASPX formatting. They are not trimming the edges of content that resides inside the template ASPX element, thus making them susceptible for formatting weirdness. The worst problem of all is that when you use Visual Studio’s auto formating (Ctrl-E, Ctrl-D by default, if I’m not mistaken) it will ruin the layout and you might end up with a Repeater that has an extra space even if you didn’t want it. I can understand why the edges were not trimmed, so that you can and should be able to enter white spaces as part of your template, but Visual Studio itself when formatting a document to be more clearly read will mess things up and that is the true problem. It is often overlooked, but Response.Redirect has an overloaded method which has two parameters. The first is like the overloaded version which gets only one parameter – the URL to redirect to. The second is whether to end the request now or let it complete and only then redirect. This means that the request will end right after the execution of the Response.Redirect function and no other code that is hooked to events that occur after the place in which you called Response.Redirect will execute. For example, if you have a certain code at the Page_PreRender event and you are calling Response.Redirect in the Page_Load event (either on the page or in a control on the page), without using the overload version of Response.Redirect that gets two arguments and setting the second argument to “false”, the code in the Page_PreRender event will never get called. While this seems very trivial, there are a lot of bugs that sometimes occur because people forget the Response.Redirect with one parameter stops the execution of the request. Every time you call Response.Redirect, stop for a second and think if you really want to end the request at that point or let it continue to process until it finishes. Thinking 2 seconds before writing a Reponse.Redirect code can save a lot of minutes debugging and figuring out that you never reach the other code because the request ended at the Response.Redirect call. At my day job, we started getting a strange compilation error when accessing one of the pages (the ASPX file). Upon first access to an ASPX file, ASP.NET parses the ASPX file and combines it with the ASPX.cs/ASPX.vb (code behind) to create one single .cs/.vb file, compile it and loads it into the memroy. This was just a simple page. Not fancy AJAX code. You can see how it looked when I set customErrors=”true” in the web.config here. After digging a bit more, I’ve turned on the debug=”true” in the <compilation> tag in the web.config file and got a more details error (look at the screenshot here). I was not familiar with any System.Web.UI.Compatibility namespace in ASP.NET so I searched throughout the project. I came across this namespace in the web.config file itself in the <system.web> \ <pages> \ <tagMapping>. This set of configuration tags is added for use with AJAX.NET and it simply says that if you see System.Web.UI.WebControls.CompareValidator replace it with System.Web.UI.Compatibility.CompareValidator that is found at System.Web.Extensions – System.Web.Extensions is one of the AJAX.NET assemblies. A light bulb flickered above my head and I figured that the problem was in the ASPX compilation. When you set debug=true in the <compilation> tag in the web.config, the path at the bottom of the error page will actually include the temp .cs/.vb file ASP.NET has created as well as a few .cmd file which are in fact the command line passed to the C#/VB.NET compiler to compile the code. I checked it out and it seems System.Web.Extensions was missing from the command line. I’ve added it to the <compilation> \ <assemblies> and it worked. I still don’t know what is the exact cause of this problem, but I figured having an extra reference in the compilation shouldn’t cause any harm. At least for now. In my previous post about problems with wrongful escaping of the query part in the uri in Request.QueryString, I’ve received a comment from a reader named DuncanS saying that he encountered a similar behavior with the Uri class. It seems Uri.ToString() function will perform unnecessary unescaping of the different parts of the Url that were escaped (like the query part) to be unescaped. His solution to the problem is to use Uri.AbosluteUri instead which does not exhibit this behavior. Thanks for the tip Duncan!